11-02-08 — The earth tilts subtly on its axis, days grow shorter, nights grow longer, temperatures cool, and the magic act begins. 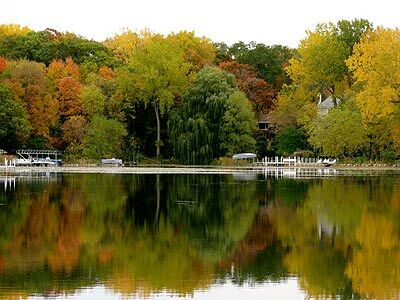 I can think of only one or two seasons in my lifetime in which trees across the upper Midwest put on a grander show of fall color than in the weeks just past. 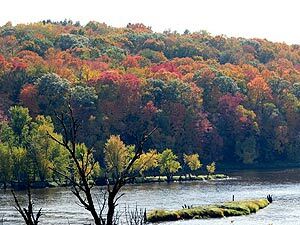 With the exception of the photo taken from the Minnesota side of the St. Croix River, bordering Wisconsin, all the photos in this update were taken within two miles of my home in Deephaven, Minnesota. 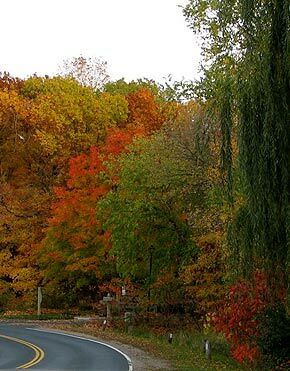 It’s a lovely area in which to live, named by an early settler who described it as, “a haven deep in the woods.” Oak, maple, ash, elm, beech, birch, aspen and cottonwood are in great abundance, and when their leaves turn color in fall the show is as exquisite as any place on earth. St. Croix River, near Stillwater, Minnesota. So what causes leaves to change their color? It begins with a fall food shortage. Spring through summer, a tree is busy growing, taking up water through its roots and the naturally occurring gas, carbon dioxide, from the air. These two meet in the tree’s food factory: its leaves. Add sunlight, and within each cell of the leaf, the water and carbon dioxide turn into glucose, a form of sugar. This simple chemical process is called photosynthesis, “putting together with light.” The sugar produced is the food that supplies the energy that the tree (and, indeed, every plant) needs in order to grow, to heal a wound, to shrug off disease, to bear fruit, or to bloom, as the case may be. This process is aided by an important chemical catalyst called chlorophyll, that happens to exist in great abundance in leaf cells. It also happens to be green. As more and more glucose is manufactured in the leaves, chlorophyll is continually being produced and broken down, and leaves acquire a green color. Chlorophyll is not the only color agent in leaves in summer. Carotenoids exist naturally in leaf cells as well, and induce the colors yellow, orange and brown. But so much chloropyll is produced in leaves in summer that all you see is the green. 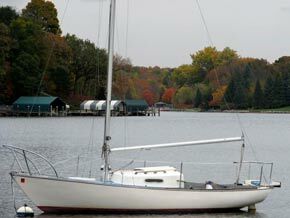 Carson Bay, Lake Minnetonka (both photos). This isn’t always true in other parts of plants. It is the high level of carotenoids that make bananas yellow and carrots orange. The leaves of both these plants are green because that’s where most of the chlorophyll is hanging out, while in the fruit or vegetable that all that leaf photosynthesis is creating food to help produce, the amount of carotenoids greatly outweigh the chlorophyll, so the color from the carotenoids win out. In the case of bananas, the carotenoids don’t take over until after the bunch has been picked, and the bananas are no longer connected to the tree. This is why fresh bananas that you buy are light green, but in a few days turn yellow. This is also why if you pluck a leaf from a tree in July, in just a few days it will begin to change color. Cut off from the tree, it no longer is involved in the photosynthesis process, the chlorophyll level drops, and the always present carotenoids—which are not dependant on photosynthesis to exist—become apparent. The leaf turns yellow, then brown. The colors we see in leaves in autumn are there all along, but in most trees, the green from chlorophyll dominates until it fades away as the growing (food production) season ends. 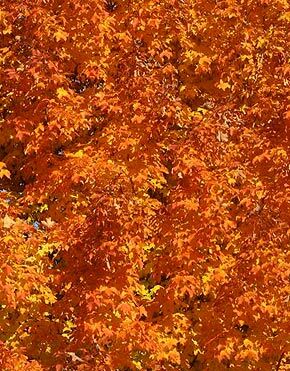 This brings us back to the axis tilt, and the reason leaves turn color in fall. Days grow shorter, nights grow longer, the temperatures cool, and the tree gets the hint. The growing season is ending. Who needs food? A tree certainly doesn’t. The food factory shuts down because it’s time to go dormant for winter. 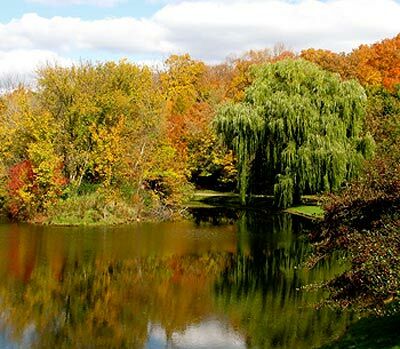 As the level of photosynthesis declines, so does the level of chlorophyll, the leaves begin to lose their green color, and the other colors step forward. Thorpe Park, above, and Christmas Lake, below. Now the carotenoids take over, in addition to a third chemical that provides color to nature’s pallet, anthocyanin. This chemical, which creates colors in the red/blue/plum range, is most often produced in autumn. Existing in small amounts in leaves during summer, it feeds on the excess glucose left over after photosynthesis shuts down. 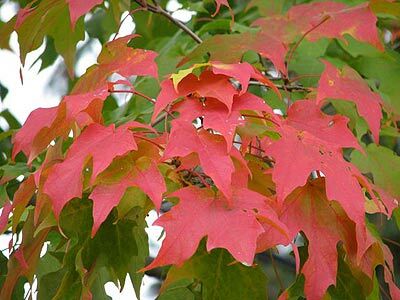 Boom: The leaves of certain species of oaks, maples, and sumacs turn red. 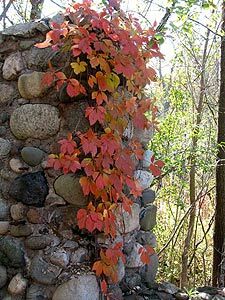 In plants that have red, purple, or dark burgundy leaves in summer, such as the Diabolo ninebark, Crimson King maple, or Sedum ‘Bertram Anderson,’ anthocyanins are in much higher concentration in the leaves during spring and summer than is usual. This happens naturally, or after decades of dickering with the plant cells in a plant research lab. The green chlorophyll is still there, and photosynthesis is still taking place, but in these cases, the level of anthocyanin outweighs the chlorophyll during the growing season. In a plant with yellow or brownish leaves in summer, the carotenoids are the victor. Again, this can happen naturally, or some guy in a lab screwed with the plant back in the late ‘70s. But nothing screwed with nature’s equation this fall. 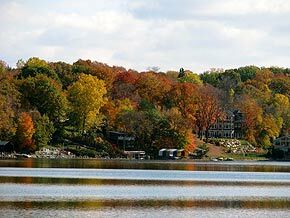 Peak colors happen in years when summer rainfall is normal, but rainy and/or overcast days dominate in early fall. Cool weather in fall—not always the norm—helps also, low temperatures above freezing favoring anthocyanin formation, which really pops the reds and oranges.